iOS 10 and Android 7.0 Nougat have been officially released – people around the globe have started to receive the new software notification over the air on all compatible devices. 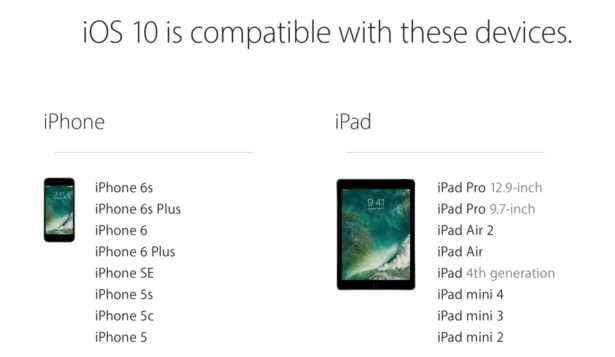 Checkout the devices those are compatible for iOS 10 OS upgrade. In the digital age ‘data security of business and enterprises’ has become a major aspect for mobile devices. 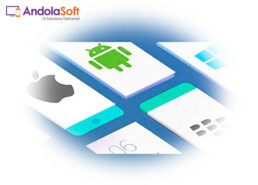 Two mobile OS Giants – Google’s Android and Apple’s iOS are the two mobile OS which are dominating the mobile world. The tough part for enterprises is to decide and then to choose the right OS that satisfies their business necessities – So need to choose wise. 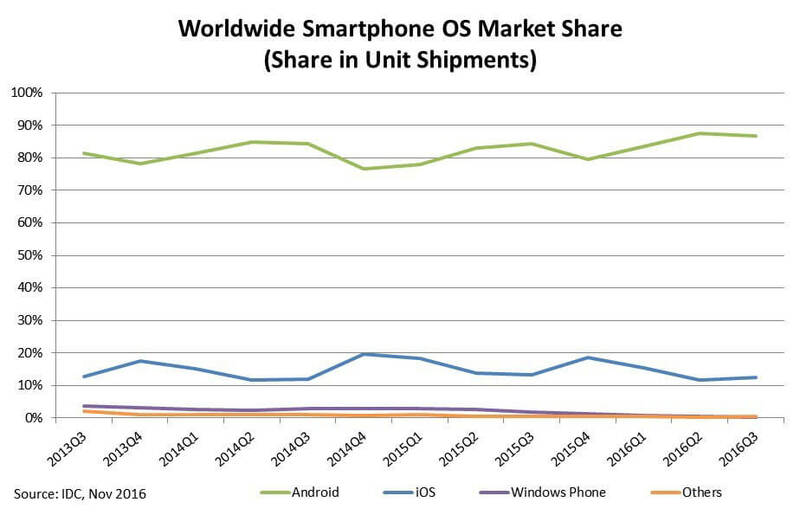 In 2007, after the launch of Android– the two tech Goliaths have been fighting hard to acquire more market shares. 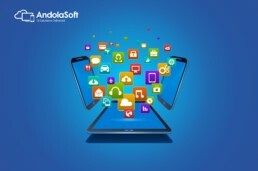 Each one of the contenders are continuously upgrading their OS with the cutting-edge features – and that is the reasons it’s so very important for business owners to be aware of these platforms its advantages, so as to decide which OS platform they should choose for their next mobile app development. These two have been able to hold 99% mobile users, while Microsoft Windows Smartphone has been able to capture only 1% out of the pie. Have a look at the image below to get a quick view of the global stats from the year 2013. Apple iOS is well known for its user-friendliness, durability and reliability where Android is cost effective with similar features. 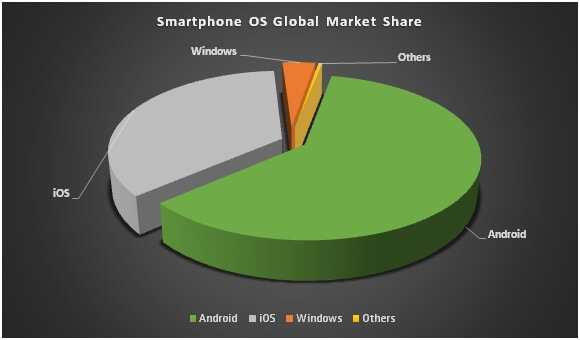 Check out the market share below. 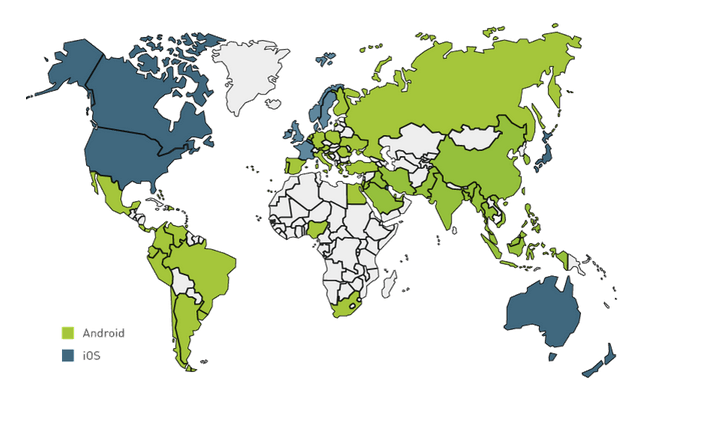 Let us have a quick look at the global map view – to know the geographical division on the way people are using iOS and Android phones. So, now we have a good knowledge about the market share of these two OS Goliaths – let’s analyze the vital comparisons of these two OS platforms: the immovable iOS 10 and the unstoppable Android Nougat. Both iOS 10 and Android Nougat are going for aesthetic design for better user experience. Hence, have redesigned their notifications and visuals. The Android Nougat notifications are much easier to read with minimalistic borders and occupy the width of the screen with smaller fonts, which can be easily tracked. Whereas, in iOS 10 notifications are through widget on the home screen. With the help of 3D touch on the home screen widget icon – one can see the notifications. Stock apps can now be deleted (well only some of them!) – by both Android Nougat and iOS 10. Though ‘Delete’ is a strong word, rather the apps are hidden from direct eye. IOS 10 and Android Nougat has app management, which allows users to switch between multiple opened apps. As of now, this feature only supports for iPad for running apps side-by-side in iOS 10 OS but with Nougat OS, one can run apps side-by-side on Android Smartphone’s. A major enhancement has been made in iOS 10 photo app – it uses the machine learning to identify people, places, and objects inside your pictures plus allows you to sort and search photos by those parameters. It also displays slideshow of your best photos, automatically. Whereas, Google’s photo app has the same features which was launched a year back. Huge changes have been made in Apple music app to make it more simplified with easy to navigate interface in Apple Music streaming. Android “Play Music” app is built with both the capabilities – streaming live music as well as listening individually downloaded songs. In some recent news made by Apple – the company said they very much want to get into the space of AR and VR but it hasn’t included any such till date. Though, we can surely expect it in the near future. Android 7.0 Nougat is of course a step above in this segment as it supports the Daydream software. You might need a compatible device to use this feature but yes, the Android is up in the charts on the Virtual Reality part with their Nougat release. Android is pushing more updates and revises as compared to iOS. Though most stock apps are getting available in Google Play store, Google is focusing to release updates in its main OS instead of updating the default app. With the massive improvement in Siri in iOS 10, the personal assistance feature has definitely got enhanced and third party app developers can link Siri to grow. Google is also playing hard to provide better personal assistance with its algorithm from years but there is a possibility of Siri to overhaul Google with iOS 10. They might! Let us see how it turns out to be. So here, you go people – now ball is in your court. Choose Wisely Choose Smart. And if you need my help in choosing the OS that’s right for your requirement. Then, please leave your comments below.